If one had not known the odd circumstances of its taking, the picture would hardly have seemed to warrant such close scrutiny. Like most photographs which are taken with a decent camera, good film, and by a photographer at least intelligent enough to keep his finger from blocking the lens, it was clear, understandable…and, like so many Polaroids, oddly undramatic. It was a picture in which you could identify and name each object, but its content was as flat as its surface. It was not well composed, but composition wasn’t what was wrong with it–that undramatic flatness could hardly be called wrong at all, any more than a real day in a real life could be called wrong because nothing worthy of even a made-for-television movie happened during its course. As in so many Polaroids, the things in the picture were only there, like an empty chair on a porch or an unoccupied child’s swing in a back yard or a passengerless car sitting at an unremarkable curb without even a flat tire to make it interesting or unique. His eyes hurt, caught between what they should be seeing and what they were seeing, and in the end the only handle he could find was a very small one: it was as if someone had changed the lens on the camera, from the normal one to a fish-eye, so that the dog’s forehead with its clots of tangled fur seemed somehow to bulge and recede at the same time, and the dog’s murderous eyes seemed to have taken on filthy, barely visible glimmers of red, like the sparks a Polaroid flash sometimes puts in people’s eyes. The camera did not moan or whine this time; the sound of its mechanism was a scream, high and drilling, like a woman who is dying in the throes of a breech delivery. The square of paper which shoved and bulled its way out of that slitted opening smoked and fumed. Then the dark delivery-slot itself began to melt, one side drooping downward, the other wrinkling upward, all of it beginning to yawn like a toothless mouth. A bubble was forming upon the shiny surface of the last picture, which still hung in the widening mouth of the channel from which the Polaroid Sun gave birth to its photographs. About five years ago, my wife, Tabitha, became interested in photography, discovered she was good at it, and began to pursue it in a serious way, through study, experiment, and practice-practice-practice. … In the course of her experiments, my wife got a Polaroid camera, a simple one accessible even to a doofus like me. I became fascinated with this camera. I had seen and used Polaroids, before, of course, but I had never really thought about them much, nor had I ever looked closely at the images these cameras produce. The more I thought about them, the stranger they seemed. They are, after all, not just images but moments of time … and there is something so peculiar about them. –Stephen King. 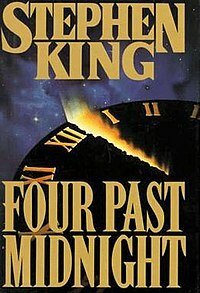 Four Past Midnight. New York: Viking, 1990.